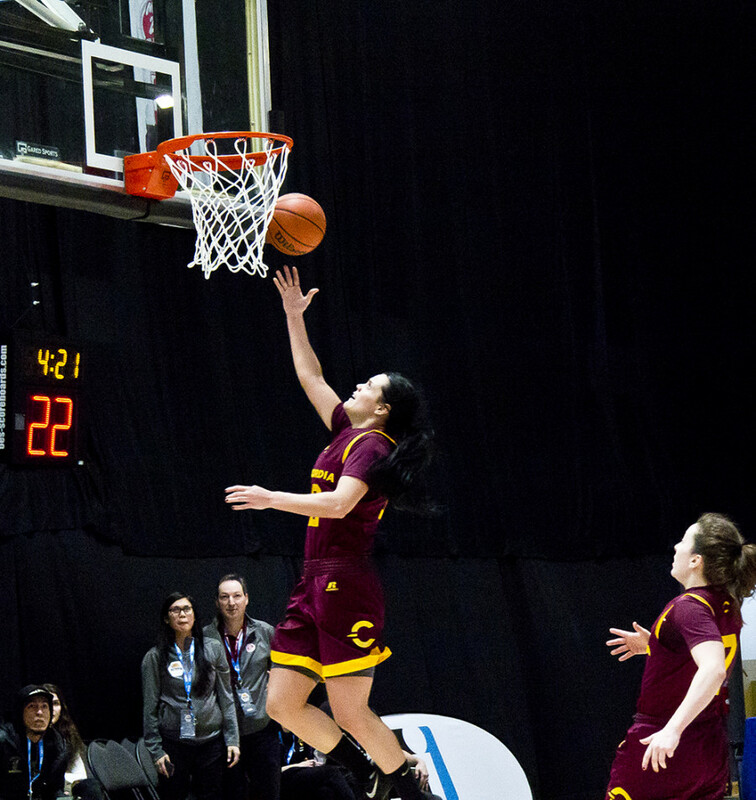 As the last seed in the Final Four of the Réseau du sport étudiant du Québec, Concordia’s women’s basketball team had to face the top-seeded Laval Rouge et Or, who had only lost twice in the regular season. The Stingers pulled off the improbable upset, with a score of 69-65, on Thursday night at the Centre Pierre Charbonneau. Present in the audience that evening was the men’s team, who had finished second in their league with an 11-5 regular season record. They cheered on their colleagues as they awaited their Friday night tilt with the UQAM Citadins—a team they had beaten three times out of four during the season—and were motivated by the chance to get some revenge, as that very same UQAM team abruptly ended their campaign a year before. On Thursday night, it certainly looked like the men’s team had every chance to beat the inferior UQAM team, and join the women’s team in competing for a RSEQ title on Saturday. As the weekend concluded, all the optimism from that Thursday night had evaporated just as fast as it was established. The road to the Final Four was anything but conventional for both teams. 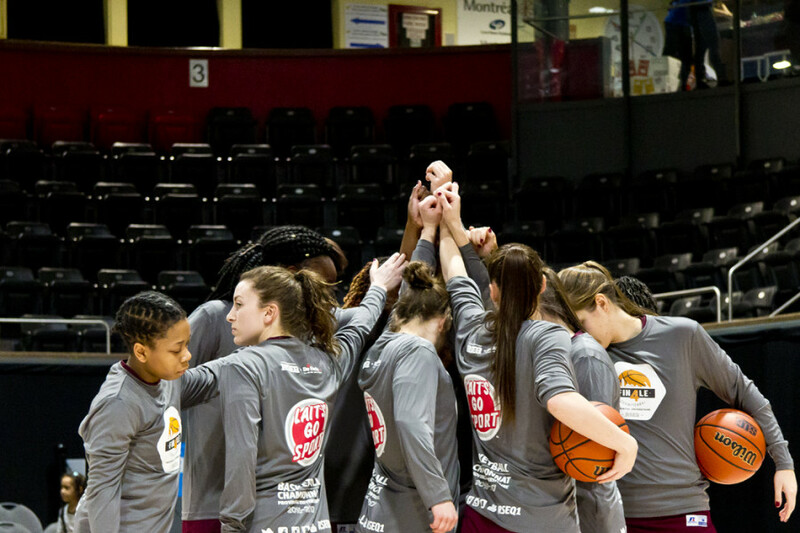 The 2015-2016 season ended in unspectacular fashion for the Stingers women’s team. They registered a win-loss record of seven and nine before the top-ranked McGill Martlets beat them in the semi-finals of the RSEQ Final Four. Still, there was optimism for what that team might be able to do the following season. Tenicha Gittens, who took over for longtime head coach John Dore in the summer of 2015, entered the 2016-2017 season with an experienced roster and a full year of recruiting new contributors under her belt. The Stingers brought back key players Richelle Gregoire, Marilyse Roy-Viau and Tamara Pinard-Devos for their fifth and final years of eligibility. They also added rookie Caroline Task and first year Stinger Jazlin Barker, who quickly became entrenched as the starters at shooting guard and point guard, respectively. The early returns, however, weren’t positive. They beat Bishop’s in their first RSEQ game on Nov. 10, but wouldn’t win another game until Jan. 7, when they beat UQAM 69-55. A four-game losing streak was sandwiched between their two wins, and they quickly found themselves in last place. On Jan. 19, a week after their first win in a month, they beat McGill. This was their second consecutive win, and their first win against the Martlets since February 2014. The win against the Martlets was a turning point for the Stingers. Prior to that game, they averaged 58.9 points per game and made 33 per cent of their shots. Those numbers got better over the remainder of the season, as they would go on to average nearly 63 points per game and improved their shooting to 36 per cent. Though they could muster just four wins in those last nine games, they did manage to beat McGill for a second time, and lose two very close games to Laval. They ended their regular season as the fourth-ranked team in the RSEQ, which meant they’d be facing Laval. “I’m excited to have one more shot at them,” she said, laughing. Roy-Viau and Gregoire were named to the RSEQ’s All-Star Team after the regular season, while Task was named the league’s Rookie of the Year, but they had their sights on bigger prizes. “We all have the same goal, and that’s to win a championship,” said Roy-Viau. The stage was set for the team. They got the matchup they were looking for, and they got the chance to get the last laugh against a Laval team that beat them four times during the season. The Stingers came into the 2016-2017 season with a lot to prove. With their surprising, season-ending Final Four loss to UQAM still fresh in their memories, the coaching staff knew they had a number of issues to address on their team. According to head coach Rastko Popovic, first on their offseason agenda was to add depth to their roster. The men’s squad brought in four new contributors, including Nicholas Noble, who was quickly able to earn a spot in the starting lineup at shooting guard. They also were lucky enough to replace graduating point guard Inti Salinas with Ricardo Monge, who had served as a backup to Salinas since the 2014-2015 season. Veteran starters Ken Beaulieu, Schneiders Suffrard and Michael Fosu joined Monge and Noble in the starting lineup. In five RSEQ games before the winter break, the Stingers won three and lost two. That record put them in second place, a good start for a team looking to break in some new players. Their early season, though, was defined by a crushing 96-56 loss to McGill on Nov. 24. They stood behind the Redmen in the standings, and the loss made it clear that the gap between those two top teams was larger than anyone thought. When the team got back from an invitational tournament in Florida over the holidays, they had to quickly prepare for a meeting with UQAM on Jan. 7. They lost that game by a single point, dropping their record to 3-3, reminding them of their heartbreaking loss that ended their 2015-2016 season. The news got worse for the Stingers. They were set to play the Redmen again, who were red-hot at that point after having won four of their last six games, including three-straight entering that Jan. 19 meeting with Concordia. With encouragement from the women’s team—who had just beaten McGill earlier that evening—and from the men’s hockey team, who sat behind the Redmen bench to distract them during timeouts, the Stingers scratched out a gutsy 69-65 win. “It was a nice way to bounce back after a couple bad performances,” said head coach Popovic after that game. Like the women’s team, their win against McGill on Jan. 19 got their season moving in the right direction. They won seven out of their last nine regular season games, including a five-game winning streak spanning from Jan. 26 to Feb. 11. The Stingers fortunes turned once they started playing better, with a more consistent offence. Before that McGill game, they’d been shooting 35 per cent from the field. After that game, their shooting improved to 38 per cent. “We asked our guys to be more aggressive and find more efficient shots,” said Popovic after their win against Laval on Feb. 25. They closed out their season with the second seed in the RSEQ. They were healthy, and had hit their stride at the right time. Everything was set up perfectly for them; they’d face UQAM in the semi-finals of the Final Four, and, should they advance, would likely meet McGill in the finals. 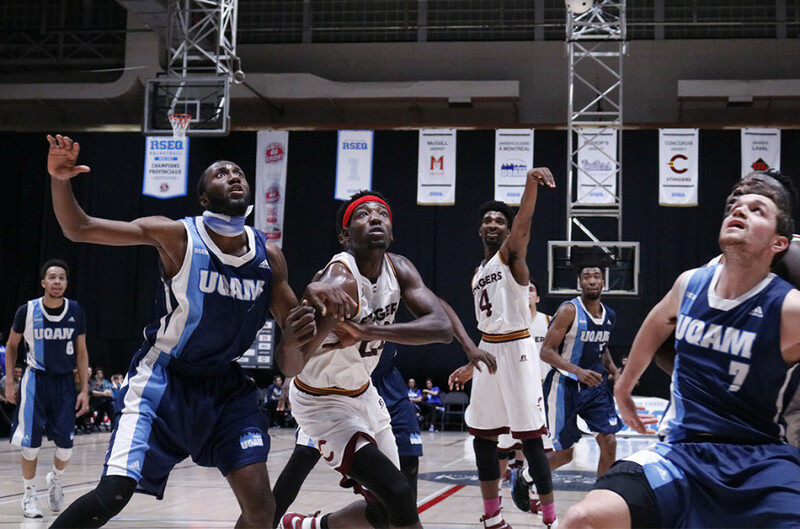 After the women’s team shocked the Quebec basketball world by eliminating top-seeded Laval on Thursday night, the men’s team was ready for their anticipated clash with UQAM. With the strong close to the regular season, the Stingers came up empty when it mattered most. UQAM outrebounded Concordia 46-36, and made 10 three-pointers in the game, en route to an 81-71 win. The Stingers stood no chance, and what looked like a promising weekend just a few hours earlier suddenly didn’t look so good. Still, there was the women’s final the next day, and they had a chance to salvage the weekend for Concordia. They faced McGill, a team they’d beaten two out of four times during the season. The fifth meeting, however, was a dominant win for the Martlets. They outrebounded the Stingers 51-30, and cruised to a 63-51 win. It was their sixth consecutive RSEQ title. The Stingers went home disappointed and empty-handed for the second year in a row. For both teams, this season may have been more painful than last because of their realistic chances at advancing to the national tournament. For both teams, an entire season was defined by one weekend. “I think this was a good first year for me,” said Concordia guard Nicholas Noble.